Sharkoon advances the USB3.0 standard even further. Concretely: on the case's front. The case and accessory specialist presents three front panels with SuperSpeed connections, which can be comfortably accessible to the front of the PC from the mainboard. The series embraces models for the mainboard, which provides USB3.0 externally exclusively on the PC backside, and also for newer mainboards, equipped internally with one or two USB3.0 pin headers. All front panels allow quick and easy installation for a 3.5 inch bay and are equipped with a black front panel. 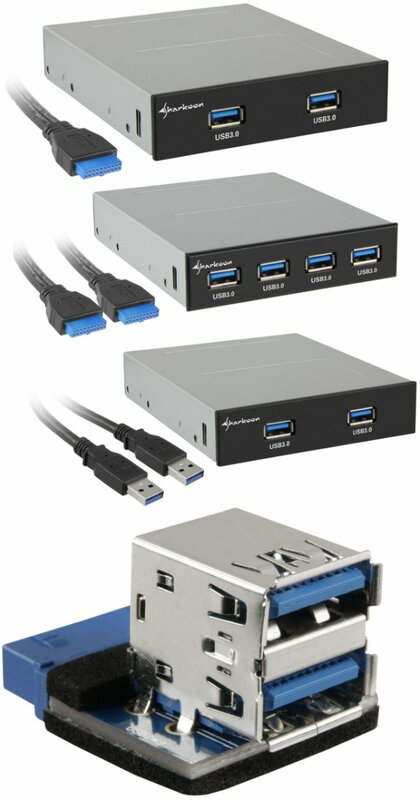 The Sharkoon USB3.0 Front Panel Model A moves the external USB3.0 port of the mainboard or the extension card from the rear of the PC to the front: The panel provides two USB3.0 ports, which are led out from the USB3.0 Type A Jack to the rear of the case and connected with two external SuperSpeed interfaces. The Models B and C provide an elegant, interior wiring for newer mainboards with 19-pin USB3.0 connectors: Model B provides an internal 19-pin connector cable with two available USB3.0 ports, while Model C provides two internal 19-pin connector cable and four USB3.0 ports. Also new to the Sharkoon product line: An internal USB3.0 adapter for users who already have a case containing front USB3.0 as well as a mainboard with a 19-pin USB3.0 header. The converter transforms the 19-pin connector into two USB3.0 Type A connectors, so that the Type A front panel cable can be connected to the outside directly to the mainboard without being detoured. The USB3.0 interface also allows it to be internally connected to the mainboard with other PC extensions - slot bezel, card readers and multi-function panel. End customers will find the Sharkoon USB3.0 Front Panel and the internal USB3.0 Adapter available from authorized retailers.